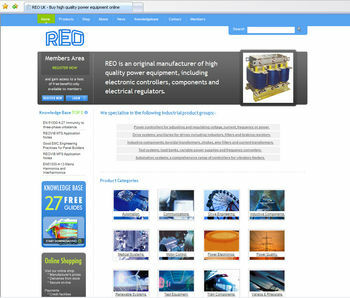 REO, manufacturer of high quality power equipment, including electronic controllers, wound components and electrical regulators has just published a new web site with the intention of helping visitors find information and solutions quicker and more efficiently. The redesigned web site is easier to navigate and offers a number of new features. These include Google search within the site, buy-on-line facilities, searchable PDF documents (including technical product data and reference handbooks/guides) and a members’ area. These enhancements will assist site visitors quickly find specific product, service and/or information on relevant legislation or ‘best practice’ requirements. The members’ area provides a resource for quick-fix of simple problems; free downloading of reference guides covering standards, testing and solutions relating to such subjects as EMC and Power Supply; plus free assessment of a problem by a consultant which could be followed up by a full consultancy at discounted rates.